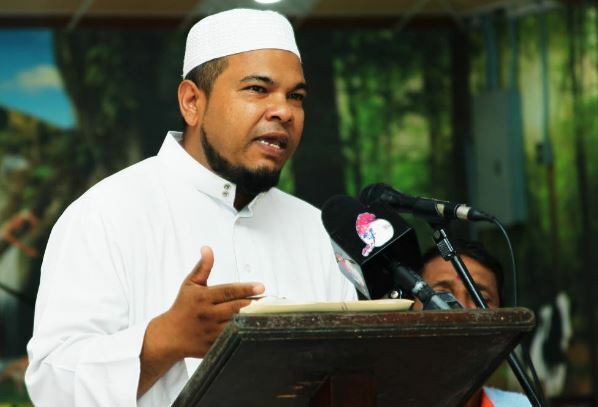 Trinidad Newsday:– DAYS after a cache of guns and ammunition was found in a mosque in Cunupia and then a man was killed in the carpark of a mosque in Arima, Imam Abraham Assif Ali yesterday said people need to be on the lookout for hypocrites and criminals who pretend to be Muslims. Speaking during a press conference at the Kailash Parvat Sharana Gatie Ashram in Las Lomas #2, Ali said Islam and Muslims are targeted in many ways in today’s society. The press conference was held to speak about safety concerns at places of worship after the ashram was robbed last Tuesday. Imam Ali expressed solidarity with the ashram and its devotees. “Before I go further, I want to say something…today Islam and Muslims are targeted in many ways but I want to say, you need to understand the difference between a Muslim and a ‘muslim’,” Ali said. “A Muslim is one who follows the way of Allah and a ‘muslim’ is a wrongdoer. Today we are surrounded by imposters and hypocrites, by people who claim they are so religious because of their attire and how they look, but in truth and in fact, they are not what they portray,” Ali said. Recalling the recent incidents, Ali said people should keep in mind that all that glitters is not gold. He said citizens need to establish justice in their lives, including justice against their own families if such a need arises.